Time to time, we see the emergence of individuals in this Blue Planet, who are more than mere Mortals. They do have something in common. They love the total mankind alike and the ultimate result of this kindness and warmth would be an Invention or a creative masterpiece. The late Ananda Samarakone was from that rare species of (human) immortals. Our country or any other country for that matter has their own folklore songs, which bloom from the cultures and heritages of the respective nations. These folklore songs are interwoven with the day-to-day work of people and also with native games. For example, we would hear damsels singing Onchili Waram, Olinda Keliya in the Sinhala New Year time and also men folk singing Pel Kawi or Paru Kawi while they do those professions. Invasion of alien nations saw the erosion of the core values of our culture and heritage thus giving a deadly blow to our folklore songs too. The history has magically given birth to individuals time to time, who came forward to revive our dying heritage; Samarakone was in the clan of those rare individuals. Egodahage Jeorge Wilfred Alwis Samarakone was born to a Sinhala Christian family at Panadura, in 1911 January 13. He was the fourth child of a family of five sons. After obtaining primary education in Piliyandala Welwala Government School, he entered Kotte Christian College to pursue with his secondary education in 1919. The year 1934 was a significant period of young Samarakone. He was 23 at the time and was teaching art and music at Christian College. That was the year of the great poet of India Rabindranath Tagore's third visit to Ceylon. Tagore's visit changed lives of many intellectuals in our country and Samarakone was among them. Tagore's inspiration led him to fly to India in 1936 to be enrolled in Shanti Nikethanaya (SN) seeking in-depth exploration into Tagore style. Few days prior to his departure to India, he tied the knot with Chandra Seneviratne, a dashingly young pupil of his mother's. In SN, he studied art and music from Nandalal Bhose and Shanti Dev Ghosh respectively. In 1937, a Brand New Samarakone came back to Ceylon with the wealth of knowledge he gathered at SN. He became a Buddhist and refined his name as Ananda Samarakone. He taught art and music in various schools in a short stint and tried his luck with Gramophone songs. At the time, Sinhala songs revolved around Gramophone and Radio. Cargills produced 100 Gramophone records under the brand name "His Master's Voice" and Ananda Samarakone was among the singers who sang for those records. Others were H.W.Rupasinghe(Rupasinghe master),Rukmani Devi, Kokiladevi Weeratunga,Lakshmi Bhai etc. Ananda stood tall among others as he gave a new pattern and outlook to gramophone songs. 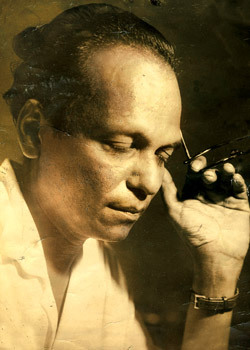 While his fellow mates sang Tower hall songs and Hindustani melodies, Ananda adopted Sinhala Folklore singing style and South Indian Wanga music style in his creations. Furthermore, he wrote lyrics and produced melodies and music for his songs, which appealed to a vast majority of people. Ananda Samarakone became a household name. Endada menike mamath diyambata Punchi suda sudu ketiya, ,Ese madura jeewanaye geetha , Besa seethala gangule ,Podi Mal Ethano..., Siri sarusara kethe touched the hearts of Ceylonese listeners. His songs inspired Sunil Shantha, Amaradewa and many more musicians to produce novel creations later. Ananda Samarakone excelled as a Singer, Musician, Actor, Lyricist, Dramatist, Artist and a Poet in 1940 decade. Many women who appreciated his talents secretly loved him. The Legendary Lata Mangeshkar singing his lyric Sri Lanka...Ma Priyadara Jeya Bhoomi. boosted his reputation as a Veteran artist. He divorced his first wife and got married again with Caroline de Silva of Galle in 1940 December 20. Then he came up with a gamut of new songs; amongst them was the patriotic song Namo Namo Matha. In the latter stage of 1940 decade, a significant change took place in the attitudes of Ceylonese people, with the Independence movement of India and Mahatma Gandhi's AHIMSA concept. The Tibetan monk Ven.S.Mahinda inspired Ceylonese people towards Patriotism. This winning mentality of the majority became gigantic force, which urged the National Leaders to fight for freedom against the Colonial rule. At the time,'God save the King' was sung in all Countries that were under the British Empire and our Country was no exception. Namo Namo Matha was sung as one of the best Patriotic songs. The child from Ananda's second marriage died in 1948 and he was utterly dejected. He flew to India again. The same year, Ceylon became a Sovereign state. Since our country did not have a National Anthem at the time, with a unanimous decision by the Government, Namo Namo Matha was sung at the eve of Independence and since then it became the unofficial National Anthem of Ceylon. The cabinet decided to officially announce Namo Namo Matha as our National Anthem in 1951 November 22. Ananda Samarakone returned to his Motherland the same year. The second phase of his artistic career was not so glorious as earlier, although he won the best song award for Manaranjana Darshneeya Lanka, which he wrote for the film Sujatha, at the 'Dinamina Film Festival' organized by the Lake House Newspapers Limited. He held art exhibitions at the Art Gallery in 1951,1957 and in 1962. Namo Namo Matha later became Sri Lanka Matha. A section of the populace saw an Omar Kaiyam in Ananda Samarakone. He was at the helm of popularity as an artist and young women being attracted towards him was inevitable. His sensitiveness denied depriving love for those who loved him. In the latter part of his life, this extraordinary individual had many frustrations and experienced loneliness. His dead body was found lying on the bed in his residence at Nugegoda, in 1962 April 3. SLBC named one of its auditoriums after his name (Ananda Samarakone Mediriya) as gratitude. In the film Para Sathu Mal , Gamini Fonseka (Bonnie Mahaththaya) on the verge of his death utters the words Heta Ira Payaida Maggie? (Will there be a dawn tomorrow Maggie?) to, one of his intimate associates. Ananda Samarakone would have uttered a more heart breaking set of words to the thin air.